Americans Casidy and Ryan tied the knot looking out over the rooftops of Florence. The couple were celebrating their union in a free marriage, without the presence of religion, churches or government requirements. Instead, they decided every aspect of their ceremony. The freedom this provides enables couples to marry wherever they desire. In Casidy and Ryan’s case, they wished to enter the covenant of marriage with the Duomo of Florence and the Tuscan hills in view. 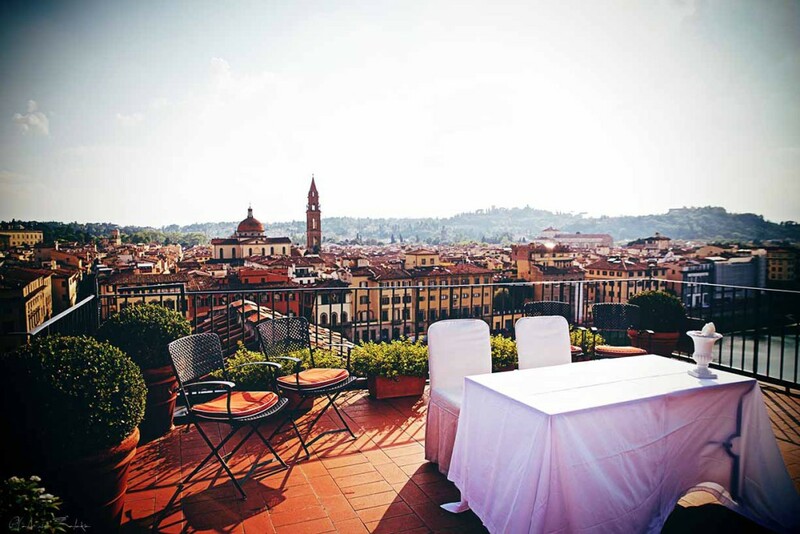 We were able to meet their request, by arranging the ceremony on the terrace of a prestigious Florentine hotel. 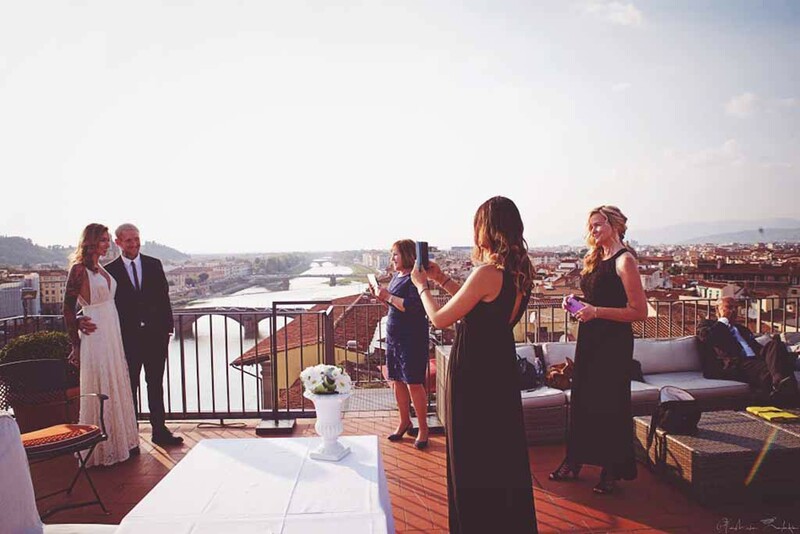 Florence is particularly suited to free ceremonies due to its unique panoramic views. 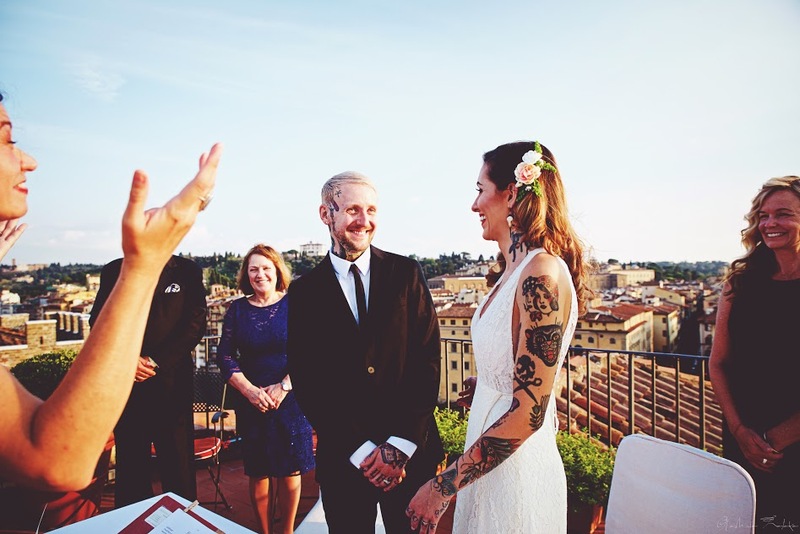 An elopement wedding in Florence itself is also ideal for intimate celebrations with close family and friends. For Ryan and Casidy, this meant celebrating with their parents and siblings. If you want to do the same, Florence offers plenty of unique and romantic places to organise weddings of all types. Whether you seek an ecclesiastical or a free marriage, it’s a magical place to start your life together. As one of the great centres of Italian art, Florence offers some wonderful museums, but it also combines atmospheric small alleyways and grand stately palaces. This makes the Tuscan city the ideal backdrop for truly special wedding pictures. After Ryan and Casidy’s ceremony, the wedding parade took us through the town. We passed through the Piazza Santa Maria della Signoria, crossed the Ponte Vecchio and the Piazza del Duomo. Professional photographers were on hand at all points to capture the moment. After the walk, the bride and groom and their families enjoyed dinner at one of Florence’s most prestigious restaurants. Florence is a culinary destination as well, and offers something for all tastes and budgets. Whether you want to dine in a small trattoria or a 5-star restaurant, everyone’s preference can be satisfied. Ryan and Casidy coupled their elopement wedding in Florence with a tour of Italy, with a stop in the spa town of Montecatini Terme, very close to Florence. Tuscany is the perfect region to organise a wedding trip, with attractions like 328km of coastline, famous cities like Siena and Pisa and the chance to arrange trips to wineries or stay on local farms. It’s the kind of destination where couples can collect unique memories that will stay with them for the rest of their lives.